Frosted freebie to the kit "frosted whisper"
Please leave me a comment and I'll choose tomorrow evening 3 from you , who get my kit "frosted whisper"
Prosím nechaj mi komentár a ja vyberiem zajtra večer 3 z vás, ktorí získajú tento nový kit zadarmo. Tiež nezabudni, že ak sleduješ moj blog, každý mesiac vyberiem 1 z Vás kto vyhrá 15$ kupón do môjho shopu!!!! Fantastic colors! Harmony of colors! Thanks for the chance to win this wonderful set! Wow, I can feel the frost--great kit! Thanks for the freebie! This is absolutely gorgeous . . . thank you for the freebie. I've just discovered your designs and I'm so happy! Thank you! Your blog post will be advertised on the DigiFree Digital Scrapbooking Freebie search engine today (look for timestamp: 04 Nov [LA 04:00pm, NY 07:00pm] - 05 Nov [UK 12:00am, OZ 11:00am] ). I had to say your kit is wonderful as usual.I like the feeling of the kit, Thanks that you share with us !! Дякую, мені дуже подобаються ваші роботи! Дякую за шанс! Delicious Scrap-set, my favorite colors and a large quantity of elements - very fond of such sets, to work with them a pleasure! Thank you for your work! Тhank you for the freebie! úžasný omrzlý kit! Paráda! A díky za free. Fantastický kit Eriko,paráda a děkuju za freebie! Nadherne "ojinene" elementy. Kitse ti moc povedl! Beautiful freebie & kit! Thanks! Nádherný zimní kit a díky za krásné freebie. Thank you so much. The kit is so beautiful and atmospheric. I love it ! Amazing work Erika and thank you for the freebie!! Your Frosted Kit is exactly what I was looking for. I love the vibrant winter tones and how they contrast with the gorgeous elements. Thank you so much for the freebie. It's such a fresh and frosty kit! Very nice items! Thanks for the chance! Your kit is gorgeous! I love it's fantastic colors and frosty feeling! Thanks for the beautiful freebie and for the chance to win such a beauty! Eri wow fantastický kit!Vďaka za Freebie!!!! Erika fantasticky, mrazivy kit. Dielka z neho su nadherne. Dakujem za freebie. Thank you so much for this Freebie. I want to let you know that I posted a link to your blog in CBH Digital Scrapbooking Freebies, under the Page 4 post on Nov. 05, 2009. Thanks again. Wonderful kit! Thanks for the freebie chance to win!! LOVELY!! Thanks for your work and inspirations. Eričko-máte moc krásný kit.Minikitík už mám stažený a teď si jen přeju vyhrát ho celý ... Je moc dobře,že se najde taková šikulka a my si díky ní můžeme hrát :-)Vaše stránky už mám uložené a už se těším na další nádheru. woo hoo!what an awesome kit!Thanks for the chance to win this and for the beautiful freebie. Thank for your comments. Winners are on the blog. Thank you so much. It feels like winter just looking at this kit. What a beautiful kit and a fantastic freebie! Thank you so much. Your new kit is gorgeous - thank you so much for the matching freebie! i just discovered your stuff in the pbp newsletter and wow.... love it! I look forward to seeing more of your work. Thanks for the little sample. I love this kit, I would want to have it, thanks for the chance! Hello and thank you for this wonderful gift. What a beautiful kit. Thanks so much for sharing this freebie. oh my goodness this is gorgeous!!! Will make a beautiful layout. Thank you sooo much!!! Thanks bunches for sharing your talents! Lovely work, thanks so much! I'm so very glad Erika showed us her beautiful LO using your kit, I came immediately when I saw it! 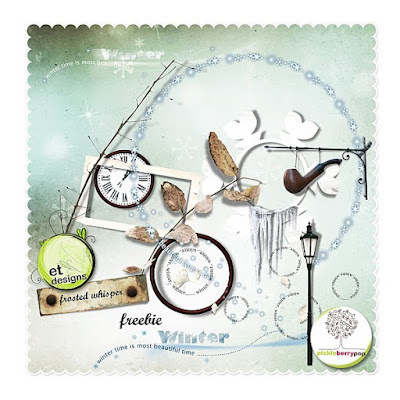 We don't have winter in my country but if we did I can imagine that's how I would like it to be :) Thank you so so much for the wonderful freebie, the pieces included are so gorgeous! I added you Freebie to my site! Thanky you ver much for share with us! Gorgeous kit, so unique and elegant at the same time. This is such a gorgeous freebie. Thanks so much for it.